PLEASE HELP alleviate symptoms of tinnitus, (this is virtually impossible without a $200,000 investment) and even then who KNOWS ?????? Search for "Hearing Aid" in Google Play. You wouldn't want external noise boosted over music playback though, that would just make everything sound worse. There are headphones which can add outside sound. I use the Sony WH-1000XM2, it comes with an android app to configure the behaviour. A cochlear implant (CI) is a surgically implanted neuroprosthetic device that provides a sense of sound to a person with severe to profound sensorineural hearing loss. Yes, this feature is intended to give you controlled sound from outside. 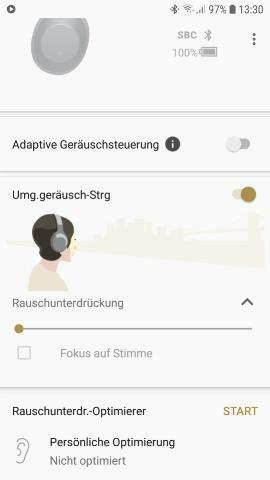 The app that comes with the headphones allows some configuration as to what frequency etc. is transferred. For further information you'd best contact Sony or forums dedicated to their hardware, as I don't use these features. I have tried these headphones at the store. The microphone for ambient sounds seems to not be very good... I don't know ... maybe it was the presets. I don't think that would be a viable solution ... I'mI'd prefer sticking to the request. Did you try both with and without "Focus on Voice" option in the app ? Well, you might also consider Andre's advice regarding "Hearing Aids". It might be possible to simultaneously play music via Poweramp and play outside sound with another app. The problem with the microphone would most likely be a delay (even with the hearing aids there was a bit.). But I'm sure it could somehow be negated. I'm not sure whether we understand the same thing when we speak of hearing aids. What I mean are not those tiny devices, but Android apps that let you listen to amplified and adapted ambient sound recorded via the microphone of your smartphone. Another idea that is so simple that you probably already tried would be the use of open headphones, e.g. Koss Porta Pro.